The rail closure affects four railroads operating on the San Diego segment of the Los Angeles-San Diego-San Luis Obispo (LOSSAN) coastal rail corridor: North County Transit District (NCTD), Metrolink, Amtrak, and the freight carrier BNSF. SANDAG is double-tracking much of the rail corridor to improve capacity for all four operators. Regular passenger rail service is scheduled to resume in time for the morning commute on Monday. Riders are encouraged to allow for more travel time on Monday, as trains could be delayed in arriving at their destinations. In Encinitas, construction crews will perform rail grinding operations to restore and extend the life of tracks, adjust track ballast for track stability, replace insulated joints, and replace rail ties. The $76.8 million San Elijo Lagoon Double Track Project will add 1.5 miles of new double track from Cardiff-by-the-Sea to the southern border of the San Elijo Lagoon. In addition to replacing the wooden trestle bridge over the San Elijo Lagoon with a modern concrete bridge, a new pedestrian undercrossing will be constructed at the south end of the lagoon. Improvements to the rail signal and grade crossing at Chesterfield Drive were recently completed as part of this project. In Carlsbad, at Poinsettia Station, crews will conduct rail surfacing work to prepare the area for the new western alignment of the existing track. For the safety of the public, pedestrian detours will be in place while crews complete work on the rail line. The $33.7 million Poinsettia Station Improvements Project will lengthen and elevate passenger platforms, install a fence between the tracks within the station, relocate a section of the existing tracks, and replace the existing at-grade rail crossings with an undercrossing featuring stairways and ADA compliant ramps on both sides of the tracks. Additional station enhancements will include new shelters, signage, and updated lighting. The $192 million Elvira to Morena Double Track Project will add a 2.6-mile second main track from State Route 52 to just south of Balboa Avenue. This new track will connect to existing double track, resulting in 10.3-miles of continuous double track from Tecolote Road to just north of the Old Town Transit Center. View the project map. This project is being constructed concurrently with the Mid-Coast Trolley Project. Ongoing construction activities are planned throughout the Mid-Coast Corridor. Crews will be building walls, installing overhead contact system foundations, working on flyover and bridge structures, and preparing for fuel line work. There will also be rail distribution throughout the site. 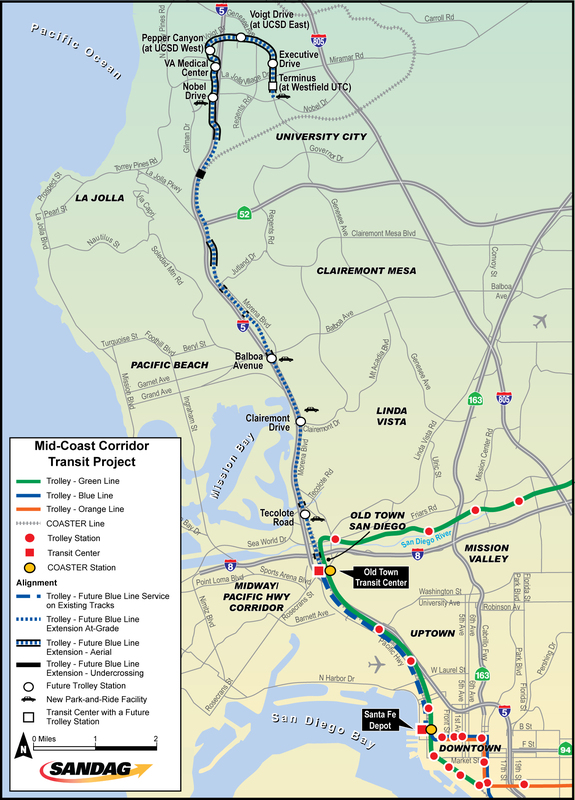 The Mid-Coast Corridor Project expected to be completed in 2021. View the project map. At the San Diego River Bridge Double Track Project near Friars Road, crews will be removing shoring beams, installing casing for fuel lines, installing counterfort walls, installing and removing falsework, and continuing on-going bridge construction activities. For a schedule of alternate routes, visitÂ GoNCTD.com, Amtrak.com, or MetrolinkTrains.com.